Marlon James - "Black Leopard, Red Wolf"
You will receive a copy of Marlon's book when you check in. There will be cards available in the lobby for you to use to ask Marlon a question. Please enter campus from the west entrance and park in the west lot. Shuttles will be available from the parking structure to the theater. The event will begin on time, so please allow plenty of time to get from the parking structure to the theater. 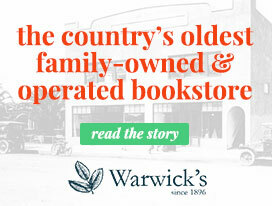 Please call the Warwick's Book Department at 858-454-0347 for more information. In this stunning first novel in Marlon James's Dark Star trilogy, an African Game of Thrones, myth, fantasy, and history come together to explore what happens when a mercenary is hired to find a missing child. Click here to read early praise for Black Leopard, Red Wolf! Below are parking instructions and directions to Shiley Theater. From Linda Vista Road, please enter campus through the WEST ENTRANCE/ MARIAN WAY. This is the closest entrance to the event venue. Once on campus, guests are encouraged to park in the West Parking Structure. From this parking structure, shuttles will run regularly to main campus with a drop off location near Shiley Theatre, which is located in Camino Hall. Signage will direct you to the theatre. Once parked, guests must use one of the payment kiosks (available on each level) to pay for parking until 7 p.m., after which time parking is free. The rate is $1.50 per hour. Pay stations accept coins as well as Visa and Mastercard credit/debit cards. They do not accept cash or American Express cards.